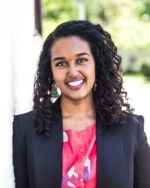 Tsione Wolde-Michael is a Ph.D. candidate in history at Harvard University with a secondary field concentration in African and African American studies. Her academic interests have intersected with public history and policy to highlight the histories of marginalized groups and provide critical policy recommendations on issues ranging from economic diplomacy in east Africa to gender and security in Eastern Europe. She has won fellowships and awards for her research from the Ford Foundation, the Woodrow Wilson Foundation, and the US Department of Education among others. Her professional experience includes working in curatorial at the Smithsonian’s National Museum of African American History and Culture, and conducting policy analysis at the Ethiopian Ministry of Foreign Affairs. She holds a B.A. in women and gender studies from Macalester College where she was a Mellon-Mays Undergraduate Fellow. Tsione grew up in Saint Paul, Minnesota. She is a Humanity in Action Senior Fellow (2008).